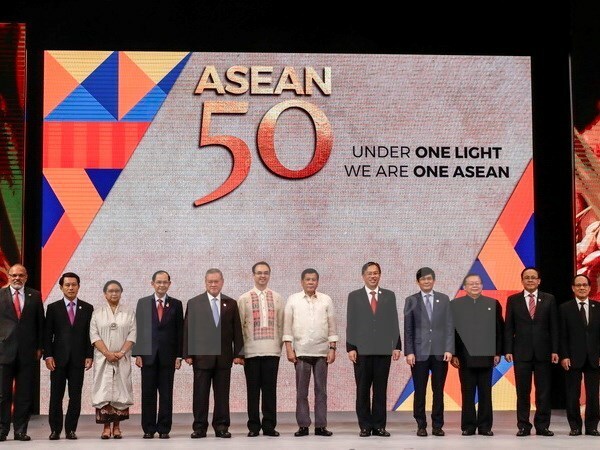 Hanoi (VNA) – Vietnam has made substantive contributions to the success of the 50th ASEAN Foreign Ministers’ Meeting (AMM 50) and related meetings held in the Philippines from August 4-8, according to Deputy Foreign Minister Nguyen Quoc Dung. Talking to the press following the event, the Deputy FM said Vietnam has worked closely with the Philippines as ASEAN Chair and other countries to put forward initiatives for implementing plans of actions, draft documents, strengthen ASEAN agencies and promote consensus, thus ensuring the success of the meetings and the bloc’s prestige. As coordinator of ASEAN-India relations, Deputy Prime Minister and Foreign Minister Pham Binh Minh and India’s Minister of State for External Affairs V.K Singh co-chaired the ASEAN-India Foreign Ministers’ Meeting, which produced important outcomes, including the approval of the theme for the ASEAN-India Commemorative Summit as “Shared Values, Common Destiny”. The two sides also agreed to accelerate the signing of an MoU on the establishment of the ASEAN-India Centre; work together to draft the Delhi Declaration to mark the 25th anniversary of ASEAN-India ties; and pinpoint priority fields for bilateral cooperation in the time ahead, such as connectivity, marine cooperation, terrorism combat and bio-diversity. Regarding the East Sea issue, Vietnam has upheld the spirit of solidarity and a common voice of ASEAN to prevent different viewpoints from affecting the atmosphere of cooperation and outcomes of the meetings, while firmly protecting the country’s interests. Deputy FM Dung noted that together with many countries, Vietnam raised concerns about the situation in the East Sea, including activities of reclamation, construction and militarization, while calling for maintaining principles and stance regarding the East Sea already specified in ASEAN documents as well as agreed by ASEAN and its partners, especially the peaceful settlement of disputes without use or threat to use force while respecting international law, the 1982 UN Convention on the Law of the Sea and diplomatic and legal process. Vietnam and other countries also appealed to partner countries and the international community to continue support efforts of ASEAN and China to fully and effectively implement the Declaration on the Conduct of Parties on the East Sea and push for early and result-oriented negotiations for an effective and legally-binding Code of Conduct of Parties on the East Sea. The diplomat also highlighted that on the sidelines of the AMM 50, Foreign Minister Pham Binh Minh held a series of bilateral meetings with his counterparts from Singapore, Indonesia, the Philippines, Australia, Laos, Canada, the US, New Zealand, China, Japan and the Republic of Korea, and the High Representative of the European Union (EU) for Foreign Affairs and Security Policy. During the meetings, FM Minh emphasized Vietnam’s policy of deepening ties with the countries and partners on an equal and mutually-benefiting footing with a focus on people’s interest and for peace, stability, cooperation and development in the region and the world, according to Deputy FM Dung. Vietnam and the countries also agreed to maintain contacts, enhance the efficiency of cooperative mechanisms, and coordinate to make good preparations for upcoming visits by their high-ranking officials. “Overall, Vietnam’s contributions to the AMM 50 demonstrate the country’s proactiveness, high sense of responsibility and maturity in regional integration, thus enhancing our role and prestige in the ASEAN and in ties with partners,” Deputy FM Dung said.